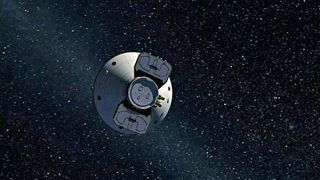 NASA?s nextspacecraft to visit Mars has changed course to zero in on its red planetlanding site. The PhoenixMars Lander fired its thrusters for 35 seconds Thursday to fine-tune itsheading for a planned May 25 landing near the Martian north pole. ?This isour first trajectory maneuver targeting a specific location in the northernpolar region of Mars,? said Brian Portock, chief of NASA?s Phoenix navigationteam at the Jet Propulsion Laboratory in Pasadena, Calif., in a statement. Phoenix?s targeteddrop zone is an area that mission scientists have dubbed ?Green Valley. ?The region is a broad, flat valley where mission planners plan to land Phoenixsomewhere within a 62-mile by 12-mile (100-km by 20-km) ellipse. "Ourlanding area has the largest concentration of ice on Mars outside of the polarcaps,? said Phoenix principal investigator Peter Smith of the University ofArizona, Tucson. ?If you want to search for a habitable zone in the arcticpermafrost, then this is the place to go.? RayArvidson, chair of the Phoenix landing site working group and veteran Marsscientist, toldSPACE.com that the lander?s target zone offers smooth terrain with afew scattered rocks. It is also home to so-called ?polygonal? plains that areexpected to harbor dirty water ice beneath their surface, added Arvidson, whois a co-investigator for Phoenix?s robotic arm at Washington University in St.Louis, Mo. Some fivemillion rocks have been mapped in the region by spacecraft orbiting Mars,mission managers said. "Wehave never before had so much information about a Mars site prior tolanding," Arvidson said in a statement. NASAlaunched the $420-million Phoenix last August on a mission to the martianarctic, where it is expected to use a robotic arm-mounted scoop to dig into thered planet?s surface to study Mars water ice and soil. Researchershope the probe?s onboard ovens, wet chemistry lab and other instruments willdetermine if its landing site may have once been habitablefor microbial life. Phoenix is also designed to double as a Mars arcticweather and atmosphere-monitoring station. But first,the probe has to reach Mars. Thursday?sthruster firing was the second of five trajectory tweaks planned duringPhoenix?s 422 million-mile (679 million-km) trek to Mars. The spacecraft firstchanged course just after its August launch, with three more maneuvers plannedbetween now and landing day. UnlikeNASA?s Marsrovers Spirit and Opportunity, which used airbags to make a bouncy landingon the red planet in 2004, Phoenix?s touchdown will rely on a set of rocketthrusters that will fire in pulses to slow the craft. They rockets are designedto begin firing just 3,000 feet (914 meters) above the Martian surface and slowPhoenix to about 5 mph (8 kph) before its three metal legs touch down. Similarpowered landing approaches were used for NASA?s successful Viking landers inthe 1970s, as well as the ill-fated Mars Polar Lander, which was lost justbefore landing near the martian south pole in 1999. "Landingon Mars is extremely challenging. In fact, not since the 1970s have we had asuccessful powered landing on this unforgiving planet,? said Doug McCuistion,director of NASA?s Mars exploration program. ?There's no guarantee of success,but we are doing everything we can to mitigate the risks." SPACE.comspecial correspondent Leonard David contributed to this report from Boulder,Colo. Editor?s note: This story has been corrected to reflect the properintended landing site of the lost Mars Polar Lander.